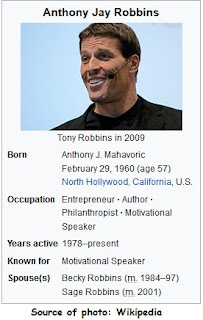 This man needs no introduction since he is famous for bringing NLP to the world. He is a motivational speaker, businessman, author and philanthropist. He is also someone known for being the husband and father a family can dream of. His wealth streams from literally every known source where money can be made. He propagate the ideology of self-help and the life changing power of determination and willpower, brought forth by utilising the tool known as NLP. However, if we are to analyse his Vedic astrological birth chart, it may gives us more clue about whether he is destined to have the Midas touch. One of the first things I saw from his chart is the affliction of the 6th House by both Saturn and Sun. Both Saturn and Sun are functional malefics and this means disputes or lack of affinity with his father (Sun being badly placed in the 6th House). 6th House represents the heath of a person and implies that he will suffer some heath issues throughout his life (He suffered from acromegaly during his teens which cause him to grow way beyond the normal size of a boy his age). To have a better idea of the potential health issues, we look at his Ascendant Lord, Mercury which we see that it is debilitated in the 7th House. Not only that, it is severely afflicted by Rahu/Ketu. Afflicted Mercury is associated with speech, mouth and throat problems, which we do not see happening (only in recent years where his hoarse voice is getting worse due to the way projects his voice). The reason the problems were not showing earlier on is because the 2nd Lord, Venus, which also associated with speech is well-placed in the 5th House (Venus being the 2nd lord - beauty of speech; he moves people when he speaks). The afflicted Mercury, which is the Lord of the 1st House, represents problems in the head area therefore it came as no surprise his acromegaly was attributed to a tumour in his head which was only discovered when he was 31 years old. He chose not to have any surgery but it can give problems when he goes into a Rahu or Ketu bhukti. Anyway, I digressed too much, so let’s focus on his wealth accumulation abilities. The 11th Lord, Moon (House of Gains) is residing in the 7th House (House of Partnerships), thus we know that the partnerships he had will benefit him financially. Next, you will notice that his 2nd Lord, Venus (House of Wealth) is located in his 5th House (House of Investments). As Venus’s degree is very close to the most effective point of the 5th House, its impact on his life will be felt the strongest. He will be able to grow his investments easily, having the Midas touch as I mentioned before. The 5th House is associated with entertainment, showmanship and luxuries. It also represents higher education and young people. Most importantly, the 5th house stands for self expression that brings joy and pleasure to a person, and that he exactly what he teaches in his motivational seminars. His limitless energy when you see him on stage can be attributed to his Mars which is exalted in the 5th House. 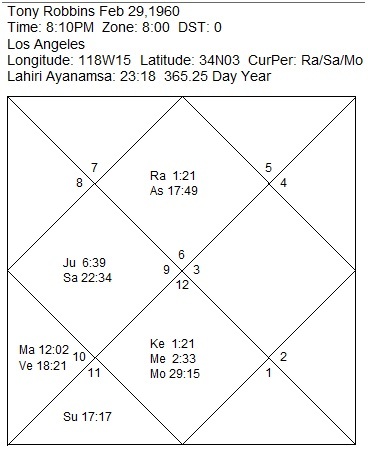 Mars is also the 8th Lord which represents easy gains or unearned income. When placed in the 5th House, the 8th Lord brings money through speculation and entrepreneurial pursuits. All the above he managed to achieve at a rather young age since he was going through the best mahadasha, which is Venus period from 1968 to 1987, making him a millionaire at 24 years old. The karaka of profession is Saturn so when it conjuncts with Jupiter, it will bring respect and high earnings to him. Mars and Venus are positioned in the 2nd House from Saturn and this would mean that he has struggled hard in his profession but in return, he is able to amass wealth and properties. 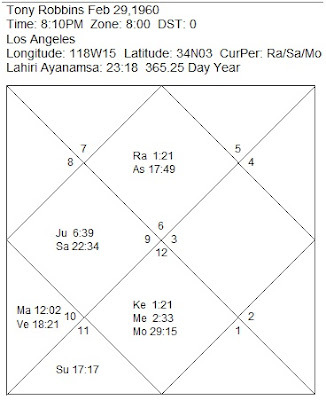 So from the perspective of Vedic astrology, was he destined to achieve such phenomenal success? Yes and there is no denial of it as we can see from above.